Click on each link below and complete the activity. 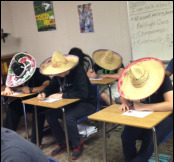 Taking a Spanish quiz. No big deal. Try these!! HUGE Variety of Review Games!! Scroll through the list and try them out. ​Work your way through all of these. Figure out what you need to practice the most. See if you can figure out how double pronouns (DOP & IOP) work. *If you made it through all of these, see what other useful sites you can find for DIRECT and/or INDIRECT OBJECT PRONOUNS! Can you find any fun games? What about video tutorials or songs? Find some tools that work for you. Challenge Board! Works like Jeopardy. Play alone or challenge a neighbor.